"How To Quickly Build A Money-Making, Responsive List In No time With Our Built-In Affiliate Army Attracting New Members For You All On Autopilot!" Prepare To Be Impressed... This Hands-Off Innovative Script Makes Viral List-Building Effortless & Very Profitable! More Than $1000 Value & Available In 3 Different Languages! Want To Build A Highly Responsive Profitable List? Wish You Could Do It In HALF The Time With Little Outlay? Wondering How To Have It Promoted For You On Autopilot? We know what it's like to waste time and money trying to build your own list... and we also understand that it can take a long time to accomplish... Especially if you decide to automate some of your system and include the overhead of a paid autoresponder service to your business. You might pay for advertising that works, but what about your sales page? Is it converting your prospects to customers? Does it automatically award bonuses to different membership levels in your program? Does it take care of member notifications for you? Attempted to build your own list with little results? Used leads services that are costly, or generate spam accusations to your account? Paid for advertising that didn't bring the response you were hoping for? Spent hours and hours using free resources that didn't even bring a single opt-in to your list? Sat waiting while the autoresponder service you're using sends out a broadcast email to your list in real-time-- and it literally takes hours, or even worse... freezes up and doesn't send properly? If you answered "Yes" to any of those questions -- join the club! Too often these days many would-be entrepreneurs online suffer disappointment when relying on other avenues to build their list... There are too many variables in the equation! No wonder so many don't become successful as they initially hoped. But now you can empower yourself to be in control of your own business, and the results you achieve will be more like you hoped, if not better! TIP: TAKE YOUR BUSINESS' FUTURE INTO YOUR OWN HANDS BY UTILISING TIME-SAVING SCRIPTS! Introducing the Viral List Autoresponder Script - Also Available In Russian & Spanish And Now Also In A Reseller Version! 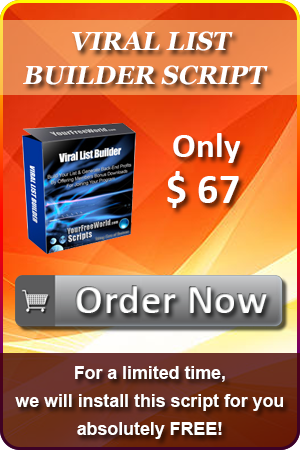 You can build your business the clever way by utilising our Viral List Autoresponder script. No technical know-how is required... You can easily have it installed on your own web server to allow you to promote to a responsive audience, without paying for it each time you send out a broadcast! Just think of the potential savings there alone! Priceless. Your Free World has developed a unique script with a quality, robust autoresponder included to achieve all that and much more. It works simply but very effectively to continually build a list of prospects for you to send your offer to as frequently as you like -- ALL ON AUTOPILOT! It's like an automated membership site script, with a built-in affiliate program and autoresponder service all in one! Now it's possible for you to build your own list in very little time, because our automated script has extra features that you won't normally find elsewhere. Complete 'back door access' sales letter with eye-catching graphics that you can modify and brand to suit your own domain/business. Four value-packed membership levels with separately categorised bonuses to download for new members, and members that upgrade. 10,000 Banner Impressions and 10,000 text ad impressions bonuses. (Value $50) for free members. 20,000 Banner Impressions and 20,000 text ad impressions bonuses. (Value $100) for pro members. 30,000 Banner Impressions and 30,000 text ad impressions bonuses. (Value $150) for premium members. 40,000 Banner Impressions and 40,000 text ad impressions bonuses. (Value $200) for platinum members. Ability to add 2 unique bonuses of your own in the money-making Reseller version to attract more traffic to your site. Ability to choose how many referrals free members need to signup before they are automatically upgraded to a higher membership. Ability to add more products of your choice to the opt-in page as desired. Ability to earn $20 affiliate commissions through the "Powered By Your Free World" link in the page footer. Ability to add your own content pages as you see fit. The ability to broadcast your email offer manually to your members whenever you wish. Setup a series of autoresponder emails to be sent out automatically to your new members at the daily intervals that YOU choose. This is a powerful feature when you want to provide information to your affiliates and motivate them to promote your business more frequently. User-friendly administration area with full instructions. Prospect can subscribe to the script very easily. After promoting their affiliate link, members will be upgraded automatically to gold level when they're referred the number of members that you set. Ability to change the welcome email and upgrade that members receive. Function to paste in basic member and gold member download bonus page HTML code. Define the number of days your new subscribers need to wait before receiving the first email in the autoresponder series. Search for subscribers via email address. Manually send a mailing and close window - without waiting for mailing to complete. All mailings to your list are carried out while you are doing other, more important things. Send emails to your list in text or HTML format. User fields such as name, email, IP address and date can be added into your emails as required. A copy will also be sent to the admin email address. Add / remove autoresponder emails to be sent automatically to your prospects. This includes the same options as Send Emails in the bullet point above, but also includes the ability to define how many days after the last autoresponder message the current one should be sent out. View autoresponder emails in your system and edit or delete them as required. Message history showing you which messages have been sent so far. The display includes: status, subject, message, and action button to delete if you wish. In compliance with FTC Anti-Spam regulations, an unsubscribe link is automatically inserted into each message sent out. Set the disclaimer message to display at the top of each message sent out. 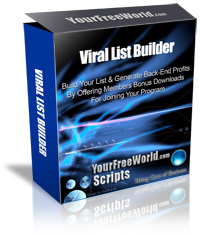 Our Viral List Autoresponder script is designed to take the worry and effort out of member communications. Once you've set it up, all you need to do is promote it and that's it. The rest is entirely automated! Terrific! Run the script from your own domain, which in effect makes you an instant publisher / program / list owner. Include your own sales letter to suit your site's target market, or change the existing one. Build a list of double opt-inprospects that you can legally email with little worry of spam accusations. Add / remove bonus products to offer your members to download automatically as you see fit. Automated upgrade feature allows members who have referred the number of new members you set to upgrade to a higher membership level with instant notification. This is a totally hands-off system! Promote a secret back-door entry to your download area. (A perfect profit-generator that is proving very popular). Include an advertising outlet for your prospects that won't cost them a cent. Customise the look and feel of the web page display to match your existing site, or create a new look for a fresh, new web site. Secured login area for Administration to inspect subscriber information, then logout on completion. Robust quality script that will stand the test of time and run without a hitch. New reseller version lets you resell the script and keep all the profits in YOUR pocket! The new reseller version also allows you to add 2 of your own unique bonus downloads to the script which can be used by the people that buy your script. This is a very powerful feature that will make you extra money and build your own business exponentially. It's really up to your own imagination when it comes to what you can do with this script. Empower Your Marketing With This Effective, Cost-Saving Script Today & Rake In The Profits Tomorrow! Build Your List The Easy Way & Allow Your Army Of Affiliates To Continually Promote Your Service So They Reap The Rewards! Either Way You Look At It... It's A Win/Win Situation Your Members Will LOVE! Take Advantage Of The Time-Saving, Profit-Pulling Benefits Of Our Automated Script In YOUR Business Today! Take a closer look around the internet and you'll probably find some scripts similar to this one being used... but not with as many feature and with a higher price tag. You can be in full, total control while our script automatically builds your list, adding new subscribers, notifying members when they qualify for the gold upgrade, sending out automated emails to your list -- and all while you can be doing other more important things! It's a most sensible move for you to take the first step to having your own Viral List Autoresponder script installed on your own domain. Affordable License : You can install the script with a single use license on one domain that you own, but it's priced to be affordable for more domains. Privacy: Your list is on your domain and your precious prospects are only available to you and no one else, ever! Reliability: When you host your own Easy list Builder script, the service should run more reliably than that of a paid service because you are the only person using it! Enhancements: If you require enhancements to your script, it is available through our development team at competitive rates. Improved Security: You won't need to worry about being hacked with this fully-featured secure script. Better mailing process: You can define how many emails you want sent per batch when background mailing is in process on your server. This effectively cuts down on server load and mail queues, keeping your web host happy. Just imagine if you were paying a monthly fee to use a list mailing service online... It would cost you anywhere from $19.95/mth up to $34.95 per month, depending on the package that you purchase. Get our your calculator and work out how much this all adds up to... You might be quite surprised to find that it adds up to several hundred dollars each year! That's quite some overhead for your business to absorb! Can you afford it? You Can't Afford NOT To Purchase Our Money-Making Script... Especially Now That It's Been Reduced For A Short Time! And Now You Can MULTIPLY Your Income By Choosing The Reseller Version If You Choose! Today, You Only Pay $67 Once For $1009.95 Value & The Script Is Yours Forever! And It Comes Complete With High Quality Product Downloads, Advertising & Pro Memberships To Offer Your New Members Immediately... PLUS Complete Sales Page & Product Graphics! Phew! What A Fantastic Find! No Monthly Fees To Pay... EVER! You Can Own This Script In A Matter Of Minutes & Be Up & Running In Less Than 1 Hour! Grab our Viral List Autoresponder Script Today & SAVE Money, Time, Effort, Stress & GAIN More New Prospects, Customers & Members To Your List! You have nothing to lose and so much more to gain by using our innovative script... You'll be thrilled with the results AND the profits it generates to your business. With a reseller license, you can sell as many copies of this script for the price you choose & pocket all the profits. Plus we give you the ability to add 2 of your own default bonus products to the script download package so you can build your list dramatically without lifting a finger! Affiliates Earn $20 per sale when promoting this script. Sell 2 copies & you will earn more than the sale price of the script itself!